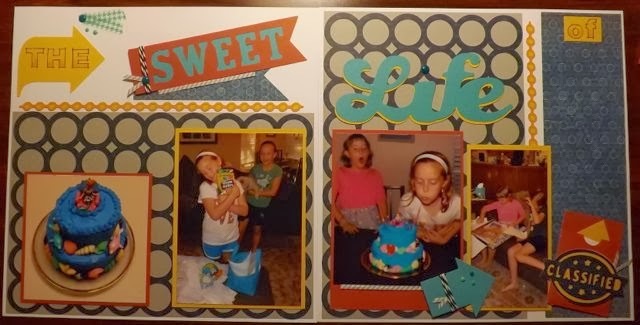 Scrappy Therapy: The Sweet Life of ? This layout was a little less intense with less stamping and less pieces! We stamped the THE and the OF and colored it with the blending pen. Did you know you could use the blending pen basically as a marker and pick up color from the lid of the ink pad and color with it! Well, you can and it is so versatile! I live the Framework Alphabet, so many possibilities two use it creatively and it now fits in with my over stamps as a size E set in a D package, just double D size, hee hee. The circle overlay, arrows, borders, Sweet banner, Life and Classified and it's envelope were all cut with the Cricut using Artbooking! The borders are two layers with two different colors! I love the detail it adds!. We uses Washi tape, Baker's Twine, Aqua Dots and Slate Twist Ties to bling it up a little! So the title of this page is supposed to be The Sweet Life of _____. I am struggling with what to put! It is my girls' 9th birthday. What are your suggestions?